Traumatic asphyxia is probably much more common than the surgical literature shows and should always be kept in mind as a possible complication of injuries of the chest and abdomen. Traumatic asphyxia or Perte’s syndrome results from a severe crush injury causing sudden compression of the thorax. During a 3-year period, we treated five cases of traumatic asphyxia, which we report in this manuscript. The patients were all male, ranging in age from 26 to 64. They suffered different types of crushing injuries: industrial accidents in two patients, run over by motor vehicles in two patients, and a farm accident in one patient. Most of the patients suffered some associated injuries, including fracture of the sternum in one patient, fracture of the right clavicle in one patient, and bilateral hemopneumothoraces in one patient. 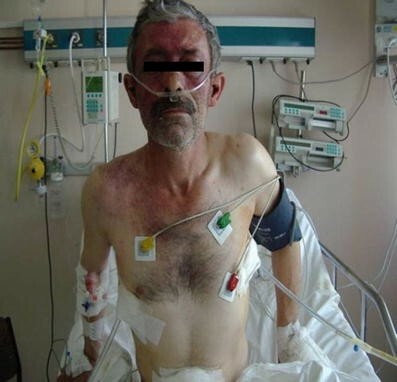 The treatment included bilateral chest tube thoracostomy in one patient, and the others required supportive treatment. There was no mortality. Treatment for traumatic asphyxia is supportive, and patient recovery is related to the generally associated injuries. Traumatic asphyxia should always be kept in mind as a possible complication of injuries of the chest and abdomen. 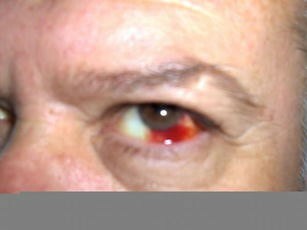 Perte’s syndrome or traumatic asphyxia is a clinical syndrome associated with craniocervical cyanosis, subconjunctival hemorrhage, multiple petechiae, and neurological symptoms. This syndrome occurs as a result of sudden or severe compression of the thorax or upper abdomen, or both. A Valsalva maneuver is necessary before thoracic compression for the development of this syndrome . Commonly associated injuries include pulmonary contusion, hemothorax, and pneumothorax. Treatment is good management of the associated injuries. Prompt treatment with attention to the reestablishment of oxygenation and perfusion may result in a good outcome. The patients' recoveries were related to the severity of the injuries and the associated injuries. A total of five patients with diagnoses of traumatic asphyxia in our department were reported during the 3-year period. All were male and ranged in age from 26 to 64 years. They suffered different types of crush injuries: industrial accidents, two patients; being run over by a motor vehicle, two patients; farm accident, one patient. The diagnosis is evident from the physical appearance, examination, and history. We quickly evaluated all patients with computed tomography of the brain, thorax, and abdomen, and if needed with ultrasonography. Laboratory studies showed elevated levels of creatine phosphokinase (CK), lactic dehydrogenase (LDH), aspartate aminotransferase (AST), and alanine aminotransferase (ALT). Most of the patients suffered some associated injuries including fracture of the sternum in one patient, fracture of the right clavicle in one patient, and bilateral hemopneumothoraces in one patient. Their head, neck, and upper chest were strikingly cyanotic and edematous, with multiple petechiae; they also had bilateral subconjunctival hemorrhages (Figs. 1, 2). The treatment included bilateral chest tube thoracostomy in one patient and measurement of arterial blood gases, oxygen, and fluid supplementation as conservative management in all patients. None of the patients needed mechanical ventilation. The hospital stay ranged from 4 to 7 days (mean 5.6 days). There was no mortality, and hospital courses were uneventful. Traumatic asphyxia or Perte’s syndrome results from severe crush injury of the thorax . The first explanation for the development of the syndrome was offered by Tardieu in 1866, when he stated “punctiform ecchymosis of the face, neck and chest are caused by the effort in which resistance to suffocation manifested itself” . It manifests with facial and upper chest petechiae, subconjunctival hemorrhages, cervical cyanosis, and occasionally neurological symptoms. Factors implicated in the development of these striking physical characteristics include thoracoabdominal compression after deep inspiration against a closed glottis, which results in venous hypertension in the valveless cervicofacial venous system . The typical pathological features of traumatic asphyxia consist of craniofacial purple congestion with petechial hemorrhages of the face, neck, upper chest, and conjunctivae . All of these findings (conjunctival/facial petechiae, craniofacial congestion/swelling) were present in all of our patients. The reason cyanosis, petechia, and edema are confined to the upper part of the body may be because the lower part of the body is protected from the elevated venous pressure by a series of valves. Alternatively, increased airway pressure may compress or obliterate the inferior vena cava to protect the lower part of the body . The outcome in traumatic asphyxia is improved by rapid restoration of ventilation and blood circulation by thoracic decompression and fluid replacement. Management of these cases included measurement of arterial blood gases, oxgen supplementation, and intubation with mechanical ventilation if needed. The prognosis is good, but a prolonged thoracic compression could lead to cerebral anoxia and neurological sequelae. The patient’s recovery is related to the severity of the injury, the duration of the injury, and the associated injuries. Traumatic asphyxia should always be kept in mind as a possible complication of injuries of the chest and abdomen. This article has not been previously published or submitted elsewhere for publication. This study has not been supported financially or technically by any organization or individual. All authors have read and approved the manuscript and take public responsibility for it.